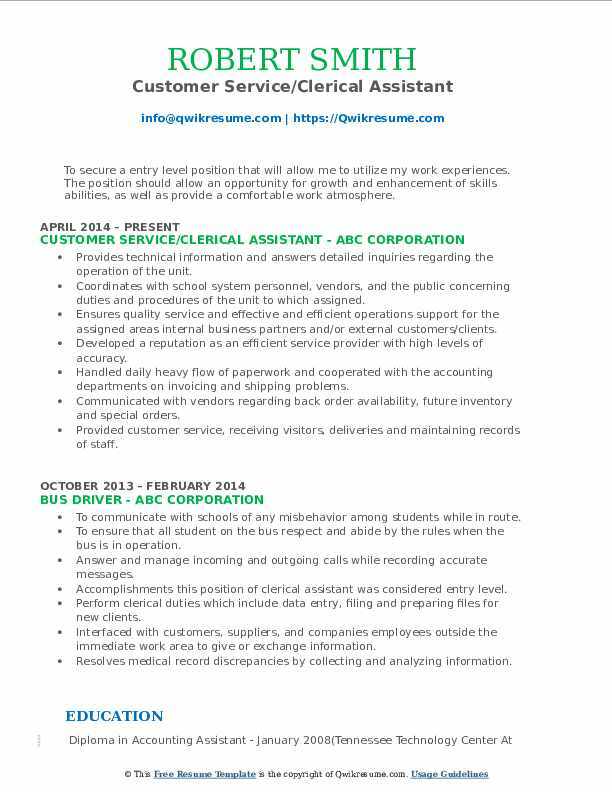 The general job description of the Clerical Assistant position is to provide administrative and clerical support to a particular department or office. The work activities listed on the Clerical Assistant Resume include the following – answering and directing phone calls, taking messages and distributing to appropriate department, reviewing files and records, checking documents and correspondence, photocopying and scanning, maintaining and updating database, performing basic account keeping functions, managing petty cash, ordering and monitoring office supplies and inventories, and maintaining cleanliness of the office work area. The position necessitates the following attributes – the ability to prioritize work efficiently, language and typing skills, knowledge of administrative procedures, organization and planning skills, customer service orientation and discretion to maintain confidentiality. While some employers necessitate only a high school diploma, many others want a post-secondary education or relevant associate’s degree. Objective : Clerical contributor seeks to obtain a challenging position that will allow for growth, development and, upward mobility; while utilizing great communication skills and expertise in performing secretarial and record-keeping tasks effectively. Communicated with customers via phone, email and in person to make appointments, set up payment plans and answer general questions. Compiled and created informational and background reports on services and accomplishments of the agency. Recruited, screened, scheduled and performed background checks on potential job candidates. Followed and executed specific orders regarding reporting and billing for specific events. Performed many office duties to include answering the phone, and training with other experienced senior leaders. Provides meeting coordination, attends meetings, and captures and documents meeting minutes. Summary : Dedicated customer service, professional with a strong track record of developing customer trust and resolving any concern. Call Center Representative with expertise providing customer support in high call volume environments. 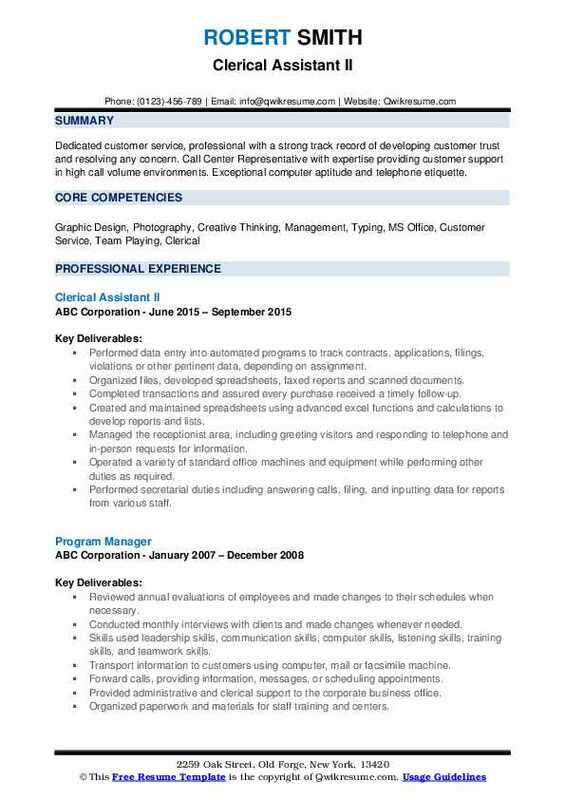 Exceptional computer aptitude and telephone etiquette. Performed data entry into automated programs to track contracts, applications, filings, violations or other pertinent data, depending on assignment. Completed transactions and assured every purchase received a timely follow-up. Operated a variety of standard office machines and equipment while performing other duties as required. Performed secretarial duties including answering calls, filing, and inputting data for reports from various staff. 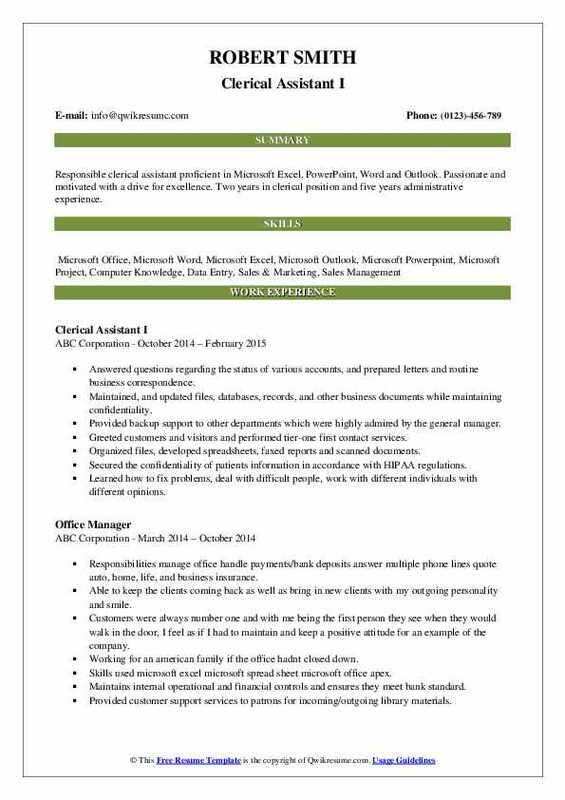 Objective : Responsible clerical assistant proficient in Microsoft Excel, PowerPoint, Word and Outlook. Passionate and motivated with a drive for excellence. Two years in clerical position and five years administrative experience. Answered questions regarding the status of various accounts, and prepared letters and routine business correspondence. Maintained, and updated files, databases, records, and other business documents while maintaining confidentiality. Provided backup support to other departments which were highly admired by the general manager. Greeted customers and visitors and performed tier-one first contact services. Secured the confidentiality of patient's information in accordance with HIPAA regulations. Learned how to fix problems, deal with difficult people, work with different individuals with different opinions. Prepares responses to correspondence or transmits to appropriate personnel for response. 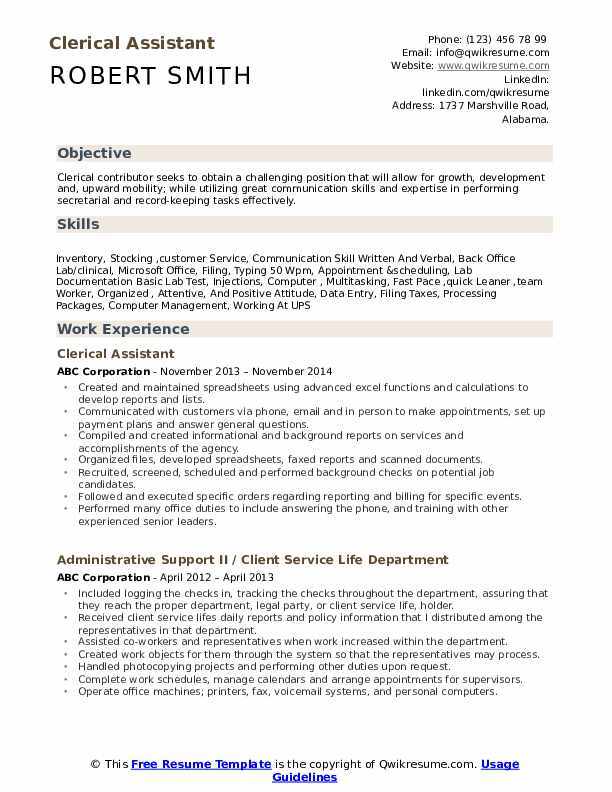 Summary : Highly talented, self-motivated and enthusiastic adult with the ability to multi task .and able to adapt to various environments; looking to obtain a position within an organization that will be the catalyst to enhancing my strong work ethic and personal desire to excel in life both professionally and personally. Filing files and paperwork, organizing the file room, and purging files when necessary to keep the file room up to date and easy access to files and paperwork. Organizing information to make it easier for other staff members to locate. Locating files and paperwork for other companies such as the inspector generals office. Helping clients fill out applications if they are unable to do so themselves. Handled photocopying projects and performing other duties upon request. Requesting closed files for the claim representatives from an iron mountain where closed files were stored. Maintains records of fees collected from the public, within the area of responsibility, and balances cash receipts. Maining and updating filing, inventory, mailing, and database systems, either manually or electronically. Summary : Seeking an interesting position with a growing company. Challenging position in related area that would best develop, opportunities for an aggressive, dedicated individual with the leadership abilities needed to advance. Maintains inventory of supplies and prepares a list of supplies to be ordered. Researched customer buying trends, and created/updated a preferred customer list accordingly. Proactively promoted and advertised sales and marketing events via phone, mail, and e-mail - increasing potential sales. Served as a central point of contact for all outside vendors needing to gain access to the building. Selected as a highly effective assistant from a competitive pool of applicants and a rigorous application process to serve in a high energy collegian environment as a clerical assistant. Sorted, screened, reviewed, and distributed incoming and outgoing office mail, and photocopied documents. Headline : Support professional with excellent customer services skills. Proficient in prioritizing and completing tasks in a timely manner. 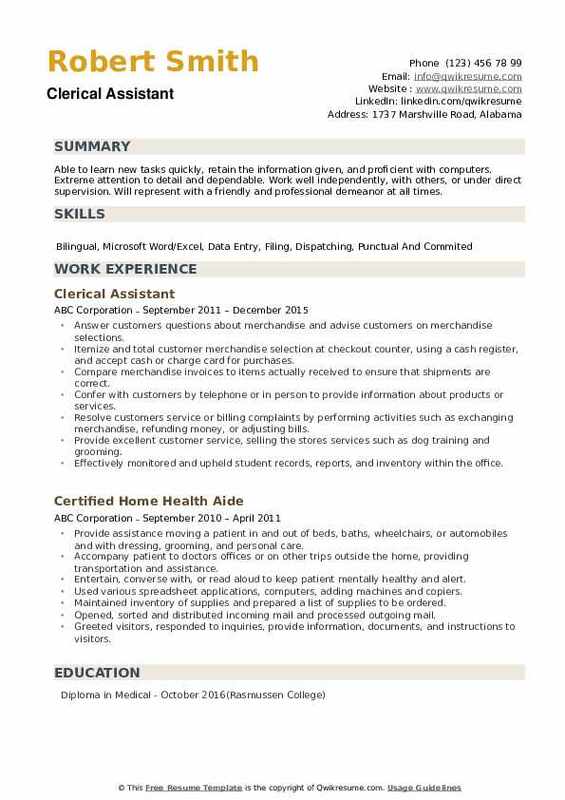 With strong Records/Customer Service skills, knowledge and high standard of work ethics, any company or corporation would find my skills to be an asset. 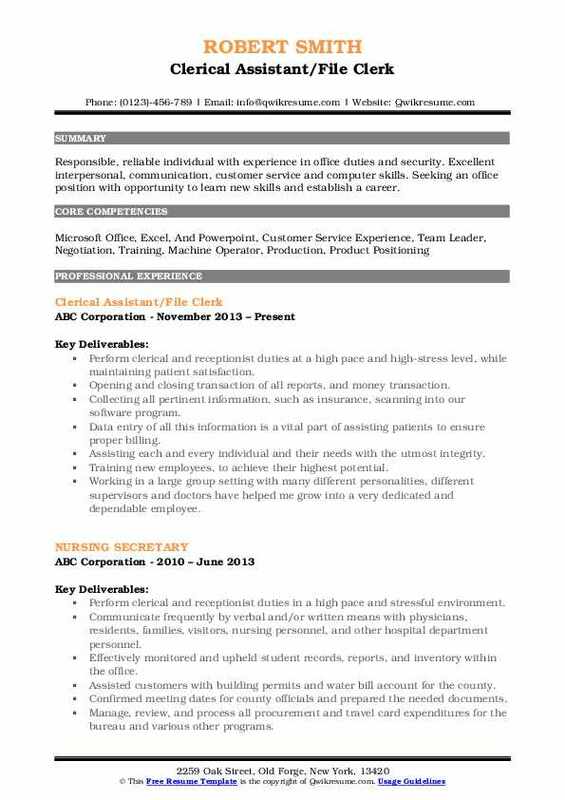 Skills : Flexibility/Adaptability Excellent Computer; Ability To Navigate Multiple Screens And Programs, Strong Communication And Problem-solving. Handled requests from the claim representatives for requesting police reports and requesting indexing reports for more information on a particular claim for the representatives. Performed a full range of departmental operations for the claims department. Review all requisitions, requests of personnel actions, internal budget requests and assist in drafting reports. Prepare appropriate authorization of loading, and reprogramming of grant and local funds. Ensure the loading of all grant funds by object class into the district's financial management system. Effectively communicated with diverse populations while maintaining a professional attitude. Managed incoming calls from potential and current customers and relayed those messages to the appropriate party. Headline : To secure a entry level position that will allow me to utilize my work experiences. The position should allow an opportunity for growth and enhancement of skills abilities, as well as provide a comfortable work atmosphere. Provides technical information and answers detailed inquiries regarding the operation of the unit. Coordinates with school system personnel, vendors, and the public concerning duties and procedures of the unit to which assigned. Ensures quality service and effective and efficient operations support for the assigned area's internal business partners and/or external customers/clients. Provided customer service, receiving visitors, deliveries and maintaining records of staff. Objective : Responsible, reliable individual with experience in office duties and security. 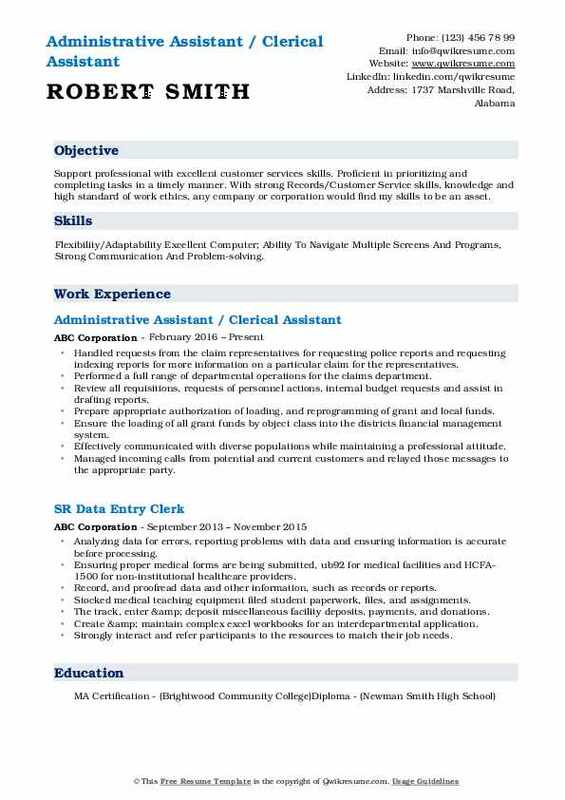 Excellent interpersonal, communication, customer service and computer skills. 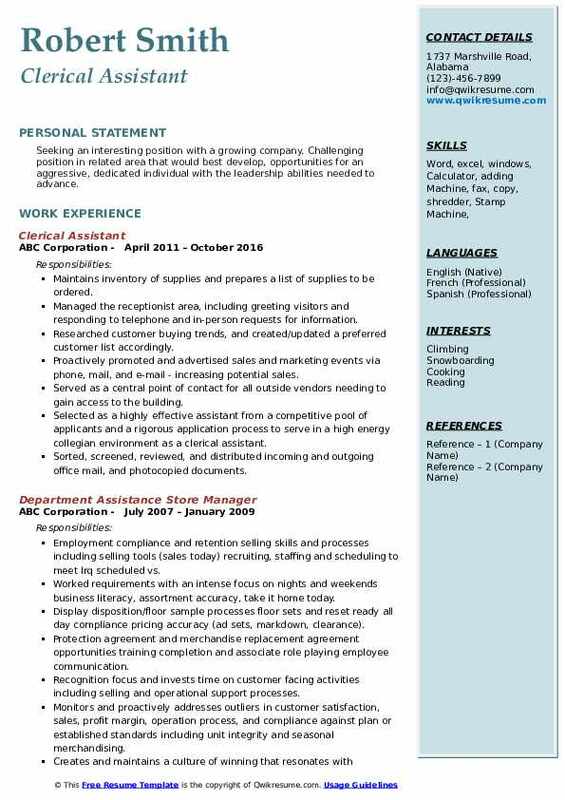 Seeking an office position with opportunity to learn new skills and establish a career. 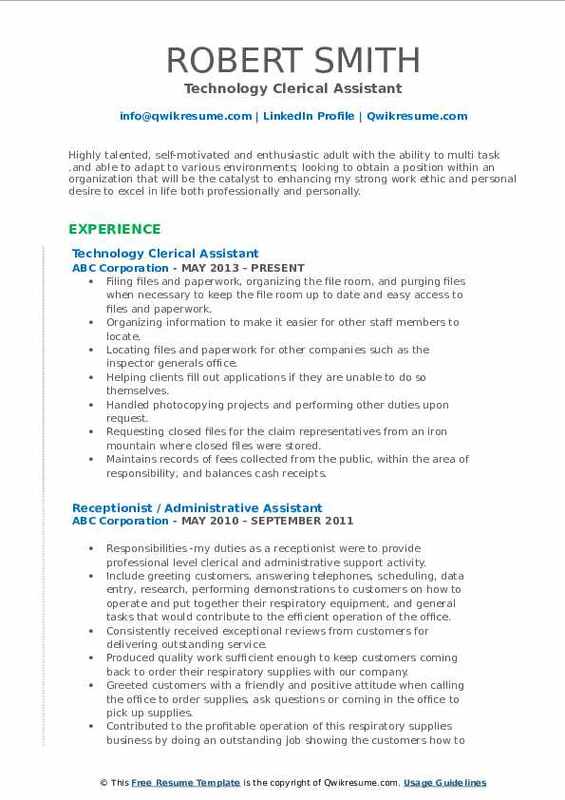 Perform clerical and receptionist duties at a high pace and high-stress level, while maintaining patient satisfaction. Opening and closing transaction of all reports, and money transaction. Collecting all pertinent information, such as insurance, scanning into our software program. Data entry of all this information is a vital part of assisting patients to ensure proper billing. Assisting each and every individual and their needs with the utmost integrity. Training new employees, to achieve their highest potential. Working in a large group setting with many different personalities, different supervisors and doctors have helped me grow into a very dedicated and dependable employee. 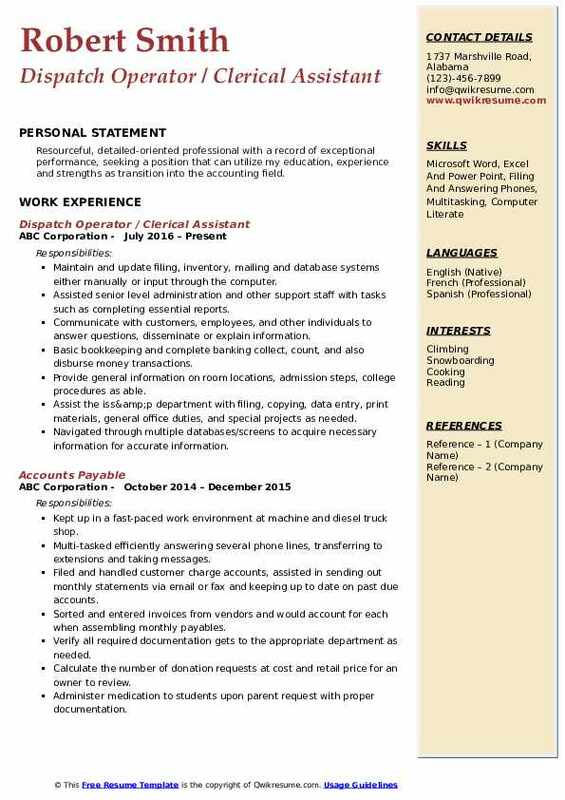 Objective : Resourceful, detailed-oriented professional with a record of exceptional performance, seeking a position that can utilize my education, experience and strengths as transition into the accounting field. Maintain and update filing, inventory, mailing and database systems either manually or input through the computer. Assisted senior level administration and other support staff with tasks such as completing essential reports. Basic bookkeeping and complete banking collect, count, and also disburse money transactions. Provide general information on room locations, admission steps, college procedures as able. Assist the iss&p department with filing, copying, data entry, print materials, general office duties, and special projects as needed. Navigated through multiple databases/screens to acquire necessary information for accurate information. Objective : Able to learn new tasks quickly, retain the information given, and proficient with computers. Extreme attention to detail and dependable. Work well independently, with others, or under direct supervision. Will represent with a friendly and professional demeanor at all times. Answer customers questions about merchandise and advise customers on merchandise selections. Itemize and total customer merchandise selection at checkout counter, using a cash register, and accept cash or charge card for purchases. Compare merchandise invoices to items actually received to ensure that shipments are correct. Confer with customers by telephone or in person to provide information about products or services. Resolve customers service or billing complaints by performing activities such as exchanging merchandise, refunding money, or adjusting bills. Provide excellent customer service, selling the stores services such as dog training and grooming. Effectively monitored and upheld student records, reports, and inventory within the office.